This fall has been quite a whirlwind much thanks to Rob Leahy of Fine Rugs of Charleston (www.finerugsofcharleston.com) who had me on the move going to Turkey and then circling down over to Charleston, SC. 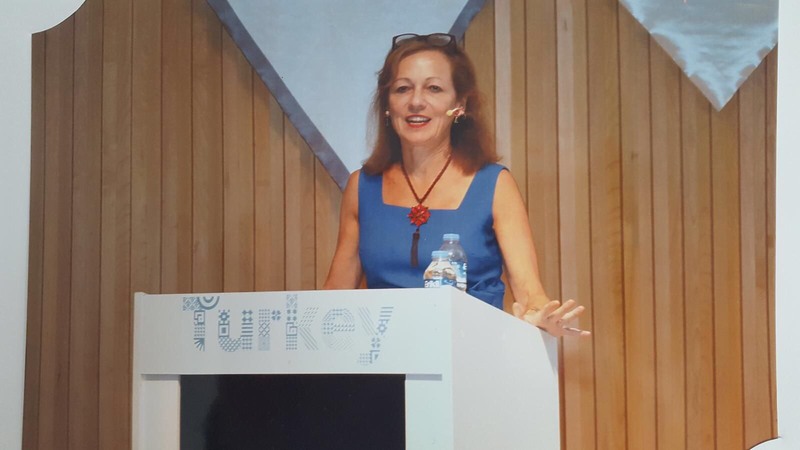 At his suggestion, the organizers of Istanbul Rug Week of Istanbul Carpet Exporters Association (IHIB) invited me to present “Rugs in the Interior Design Market—Trends & Outlook” to the international rug trade in Istanbul. For me (and my husband who accompanied me), going to Turkey was a bit like going back home. This is hardly surprising as my married life and rug journey began there so many eons ago. Just out of college, we spent 15 months living and working in Ankara while traveling throughout the country and even made it to Syria…Little did I know then how this experience would later shape my career. Being back in Istanbul was, simply put, amazing. Rediscovering our old haunts–Hagia Sofia, the Blue Mosque, and the Topkapi Palace to name but a few—was harking back to the bygone days. With fellow speakers and participants at Istanbul Rug Week. 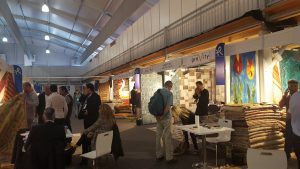 Hosted both by IHIB in collaboration with Cover and Hali magazines, the Istanbul Carpet Week (October 1-4 2017) drew over 600 attendees including an estimated 200 members of the international rug trade who hailed from the United States, Canada, the United Kingdom, Continental Europe, the Middle East, and countries further afield. 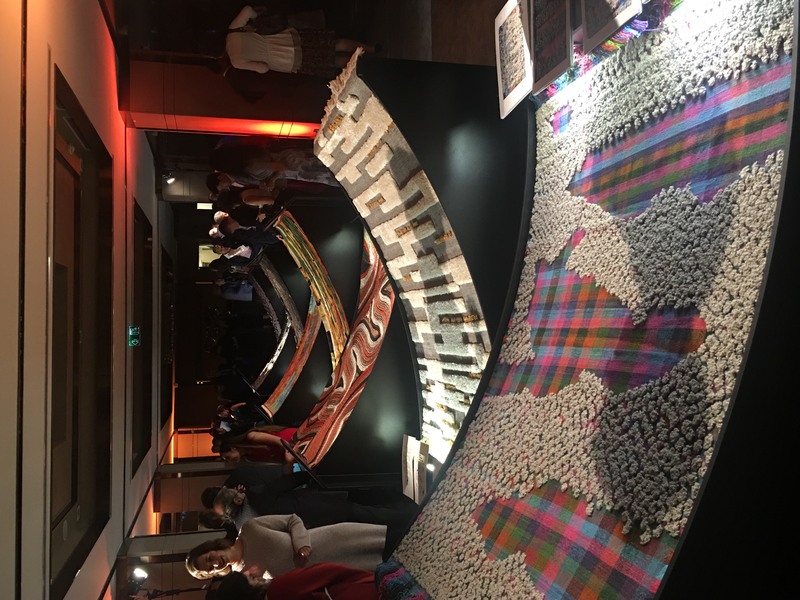 The packed four-day event included the Istanbul Rug Show with some 60 booths exhibiting Turkish handmade and machinemade rugs, the Istanbul Carpet Conference, and the Gala Awards Ceremony. 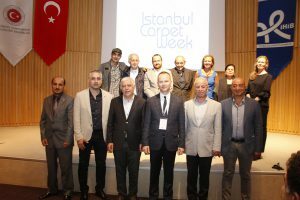 I was among those privileged to be a judge on Turkey’s National Carpet Design Contest involving Turkish students of the woven arts. For me, the highlight was the opportunity to present my views of the American interior design market—how the industry has changed in the last few years and why. 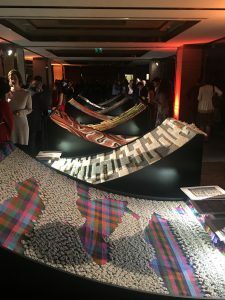 I strongly believe that the rug industry needs to publicize the uniquely sustainable aspect of handmade rug production given the increasing importance—albeit at a slow place–of sustainable design. I will expand on this subject in another post. 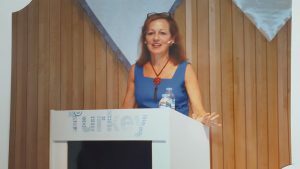 For me, it was a great honor presenting with such a talented group of speakers–Ben Evans (Editor of Hali and Cover), Gunay Atalayer (author), Matthew Bourne (of Christopher Farr in London), Louise Broadhurst (Head of Christie’s rug department in London), and Dr. Huseyin Alantar (Marmara University Textile Department Chair). It was also great fun running into my rug trade friends from all over—including Larry Stone, Roz Rustigian, Leslie Atiyeh, and of course Rob Leahy–and meeting so many new people including Fritz Langauer of Oritop in Vienna, Austria. After a wonderful dinner cruise down the Bosphorus, we were treated with the opening of two rug exhibitions—the permanent collection of 55 early Anatolian carpets and the temporary exhibit of the Arkaş collection of Kum Kapi carpets at the Turkish and Islamic Arts Museum. Despite today’s highly sophisticated digital communications, there’s really no substitute for face-to-face interaction with your peers in terms of fostering camaraderie. 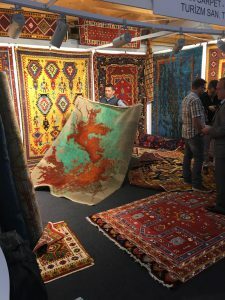 Attending rug trade events is key! Case in point: I would never have gone to Istanbul if I hadn’t met Rob a few years ago at one of the New York rug shows where he bought my book The Decorative Carpet which he then distributed to his clients. After a few weeks back in the U.S., I flew down on November 15 to Charleston where Rob hosted me in his beautiful showroom, Fine Rugs of Charleston (www.finerugsofcharleston.com). 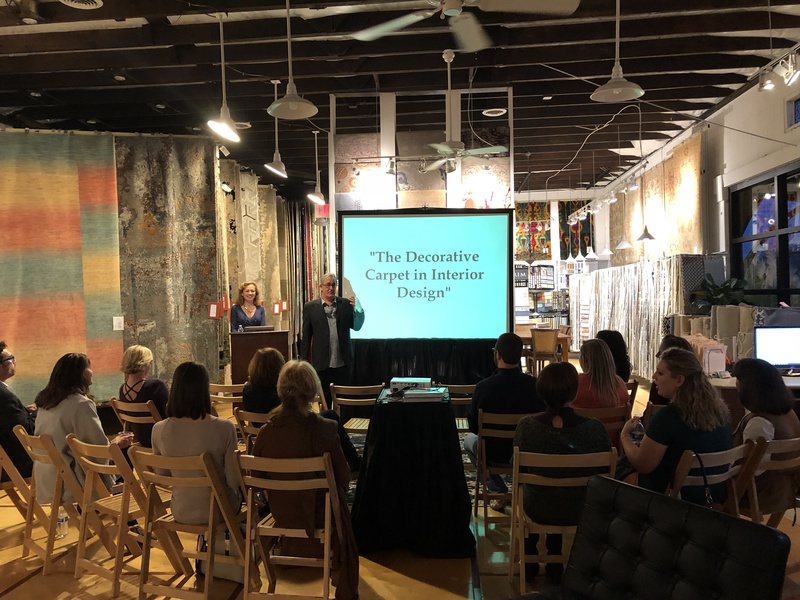 Ably coordinated by his stellar team, I presented my CEU “The Decorative Rug in Interior Design–The Key to a Successful Design Strategy” to the Carolinas’ ASID chapter. Once again, I was privileged to do what I love best—talking about the decorative importance of handmade rugs—in a world-renowned historic city. I stressed the critical importance to designers of learning the virtues of handmade rugs—from the esthetic, durability, and sustainable standpoints. With the growing challenge of internet sales, the role of the designer has evolved into being more of a curator than that of a mere purchasing agent. The designer needs to have enough appreciation of handmade rugs in order to educate their clientele on their worth and make the sale. This is the only way the handmade business can grow. Thank you Rob for sending me trotting across the globe! ← Hello to my friends at the Scarab in Sunny Colorado!